Available March 1 at Noon CT through March 31 at 11:59 p.m. CT, or while supplies last. Most of us could share stories about how cancer has touched our lives. We’ve lost loved ones; watched victories and championed for more research. Now you can help give back in one more way in March. Stand with those you love as they fight cancer, or make a declaration of your own journey while giving back with every purchase made in our March No One Fights Alone Force for Good Shop. 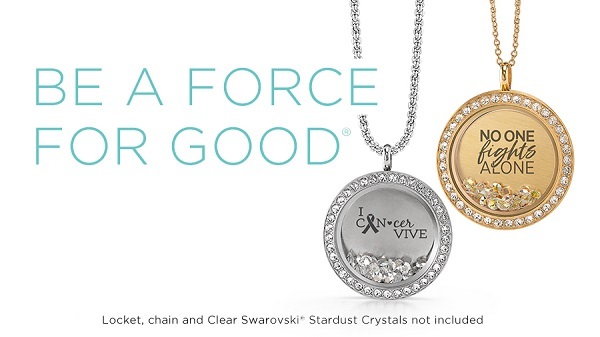 For every Force For Good Plate purchased in our No One Fights Alone Force For Good Shop, Origami Owl® will donate 50 cents to the American Cancer Society and the Canadian Cancer Society. Where: The Force For Good Shop is located under Shop > What’s New > Force For Good > No One Fights Alone Shop. Large Silver “I Can-cer Vive” Plate – Exclusive! Large Gold “I Can-cer Vive” Plate – Exclusive! Large Silver “No One Fights Alone” Plate – Exclusive! Large Gold “No One Fights Alone” Plate – Exclusive! You can find all your shareable social images and flyers under “Monthly Exclusives” and “PDFs” in your My O2 Connection mobile app and the desktop version in your Back Office under Designer Resources > My O2 Connection. You can also find the flyer in your Back Office under Designer Resource Library > Monthly Exclusives. Not yet subscribed to the My O2 Connection app? Read this for how to do it. Here are FAQs about our limited-time Force For Good Shop.